I've always had an interest in animals even at a young age. From catching frogs in the backyard pond of where I lived, to following the rabbits through the woods. I would always try to bring frogs and other little critters home with me, although it sometimes never worked out in my favor. Even though I wasn’t allowed to have outside animals inside, I would construct a home for them outside where I could care and nurture them. Being surrounded by wildlife was the highlight of my childhood, something I have continued into my adulthood. Being surrounded by animals growing up has encouraged me to pursue wildlife studies. My interest in animals has brought me to Jacksonville University in Florida where I am currently pursuing my degree. 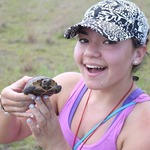 I feel very fortunate to have the opportunity to continue my passion of reptiles by working under the mentorship of Dr. John Enz, who has performed several studies on Gopher tortoises. I also want to mention Hunter Moore who will be collaborating with me and assisting me in the field this summer should this project be funded. He is currently a student in the Wildlife Program at Maryville College in Tennessee and works under the direction of Dr. David Unger. Alexandria's projects haven't shared results yet.